The no obligation phone consultation applies to both domestic and business customers in the South London region. No moth job is too large or too small for us to look into. Where relevant we are able to advise on any immediate action required to protect your property or possessions prior to a visit. 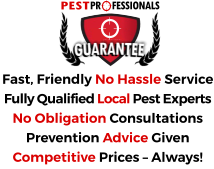 If a visit is needed we let you know if there will be a call out charge and also advise on the probable costs of any moth treatment should it be required. Most of moths in the UK (approx. 2,400 types) are harmless. However, a handful are viewed as pests due to the damage their larvae cause to materials, textiles and stored products. Unlike other pests, moths present you no health risks. But they are a severe and expensive pest in businesses where dried food produce or natural fibres play a significant part. Once within your home or business, moths can badly harm natural fibres in carpets, clothes, fabrics, fur as well as leather. Moth caterpillars cause the destruction by eating the protein (keratin) found in natural materials like wool, cotton and silk. On the one had the increased use of synthetic fibres has decreased moth issues in homes. But on the other a recent trend back towards using natural fibres in clothing, furniture and bedding means the dangers of moth damage are once again on the increase. Sensible precautions include thorough cleaning of all woollens, plus keeping wools and furs in sealed polythene bags or closely wrapped in paper in tightly closed drawers or cupboards – preferably in a cool room. Clean and vacuum carpets frequently, paying specific attention to the edges and particularly beneath furniture. Other measures you can take yourself include things like spraying affected woollen garments, fabrics, and carpets with an amateur use aerosol moth proofer, especially along seams, folds and into any gaps in floors or shelves where fluff accumulates. Spray the under felt (not rubberised underlays) and the carpet backing. In cases of serious infestation, the premises will have to be treated by a suitably qualified Pest Controller. Fumigation may be sufficient in a home environment. Heat treatment is also commonly used by businesses and where there are expensive fabrics, food stuffs and clothing. Here at Pest Professionals we specialise in heat treatment for moths in business premises – you should call us for more details. The commonest of the so-called clothes moths, with characteristic golden-bronze wings, flecked with black, folded flat along its back. It has the tendency to live in damper areas, so probably not in the airing cupboard. Eggs are laid in fabric on which grubs will feed. The larvae are creamy-white caterpillars with brown heads. They grow up to 15 to 25mm long, feeding upon wool, hair, fur, feathers, cork or debris from food such as dried fruit, cereals, or decaying organic foods items, and are commonly found in old birds’ nests, where they may enter buildings. The caterpillars spin silken cocoons in which they pupate. Only the larval stage feeds. The white shouldered house moth is a common species closely related to the brown house moth. It is now found throughout the UK due to its close association with human environments, which creates abundant food sources and the humidity it thrives on. It can be found in houses, outbuildings and factory surroundings where dried food sources such as grain maybe found. However, it is omnivorous, eating foodstuffs such as grain, bran, flour and other cereals, but also (but less commonly) feeding upon wool and other animal based fabrics. It rarely eats clean foodstuffs, but prefers mouldy and/or long-standing food, and is therefore commoner where hygiene standards are lower. Bird nests are a particularly ideal environment and, if any are located nearby, a risk for them entering the house. The Warehouse Moth is one of the most significant food storage pests in the UK, and will consume cereals, grain, vegetables, dried fruit, tobacco, nuts and chocolate. Its larva will also ruin food by excreting on it. This is the most troublesome moth in the UK and the one you are most likely to find in the wardrobe. Infestations are becoming more and more common. Moths are drawn in by perspiration odours, so clean clothes are less probable to get targeted. Damage to clothing and fabric, usually consisting of irregular holes eaten in fabrics, discarded feeding tubes and excreta from larvae, typically indicate an infestation. Larvae feed on natural fibres at night. The adult case bearing moth is brownish and has feathered ends to its wings. Each wing is 4-7mm long in width. Like all house moths they pose no direct health risks but can create significant damage, in its larval form, to natural product fibres and materials. It may also vary its diet to include synthetic materials if natural materials are not easily available. If you need sound advice or a swift solution to your moth problem anywhere in South London or the nearby Boroughs – get in touch.